This one-day workshop is aimed at non-native speakers of English who need to prepare and deliver presentations in the English language. Through focussing on the 3 P's (planning, preparation and performance) and using a “hands-on” approach, tangible improvement will be seen over a short span of time. Set in a villa in Bad Homburg, participants take a day out of their busy lives to concentrate on Presentations in English in a hands-on, fun way. Prior to the seminar, participants are asked to take an online test so we can ascertain which group is best for you. Participants will receive pre-course reading matter to maximize speaking time during the workshop. The workshop combines language input (target phrases) with hands-on output – (actual presentations), followed by trainer feedback. The presentations will be recorded to aid trainer feedback and illustrate language used. 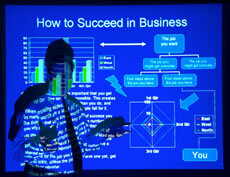 Results are immediate and can be transferred to the business workplace for future presentations. Participants are encouraged to bring authentic presentations or presentation topics to the seminar!